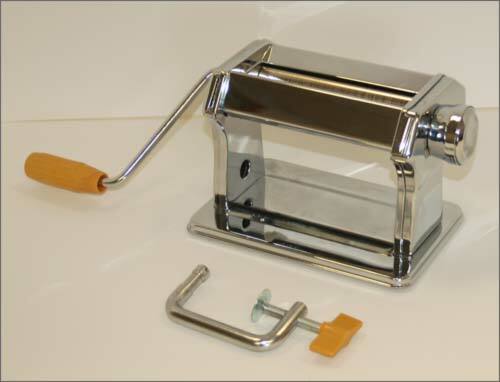 This pasta machine was never intended for the kitchen but was designed specially for polymer clays. Our "pasta machine" was designed for polymer clay and is essential in order to roll out 1/8 inch (0.3 cm) uniformly thin sheets of clay that are perfect for the sculpting method taught in our Sculpting Training DVD. Using these thin uniform sheets of clay is one of the secrets to rapidly sculpting your newborn. Combine the benefits of the clay sheets with the features of our sculpting form and you will make your sculpting easier than ever! Note: Pasta machines designed for food purposes will not work with polymer clay. They are more expensive and too narrow causing the clay to jam the machine.